This week will probably be one of the most critical in Europe's history. On Thursday a European summit will decide how to handle sovereign debt, as well as the banking crisis and also the Greek economic crisis. We are used to seeing European summits ending in compromise. This time it could be different. The positions of the protagonists on fundamental issues such as common debt, direct aid to shaky banks and the Greek crisis are so opposed, and the ground for compromise so narrow, that rather than compromise the summit may simply result in a deadlock. Let's start with the most urgent issue, the Greek crisis. Early elections on June 17 finally produced a government, but quite a strange one. The winner of the elections, Antonis Samaras, leader of the New Democracy party, succeeded in forming a coalition government with the support of two leftist parties, the Panhellenic Socialist Movement (PASOK) and the Democratic Left (DIMAR), but these parties have declined to contribute ministers to the government, content to support them with a vote of confidence. Obviously the moderate left, facing aggressive opposition from the Coalition of the Radical Left (SYRIZA), does not want to take the full weight of government on its shoulders in case the attempt to renegotiate the current belt-tightening measures, which constitutes the backbone of the new government's policies, fails. This failure is more than probable. Samaras has made it clear that the stabilization program of the troika -- the European Commission, the European Central Bank (ECB) and the International Monetary Fund (IMF) -- is not working, and that its results are so painful (you can have a quick look at my previous article, “Sisyphus and the Danaids”) that it should be renegotiated. Samaras has asked to postpone austerity measures, worth 12 billion euros for the period 2014 to 2016, and prolong unemployment indemnities for up to two years, further extending them to the self-employed. Furthermore, he intends to implement a series of tax breaks, such as decreasing VAT in restaurants from 23 to 9 percent to give a push to the tourism industry and lowering the tax on profits to 15 percent, aiming to encourage investment. To balance this, he says that he is ready to accelerate privatizations. To put it simply, Samaras wants to increase public expenditure and decrease tax revenue, hoping that these measures will produce some growth. Indeed, a 4.7 percent contraction had been forecast for this year, but now experts are talking about a contraction of more than 6 percent, given the ongoing crisis. Even if the measures proposed by Samaras work, it is obvious that this will take time, and meanwhile Greece will have a much higher budget deficit than the 7.3 percent predicted for this year. I do not think that the promise to accelerate privatizations can convince even the supporters of renegotiation in Europe, given the fact that privatizations have yielded only 1 billion euros until now. The Greek crisis is not uniquely the headache of Europe. Spain has a government very committed to applying its own belt-tightening measures. The problem is that its banking system is on the brink of failure. The estimated cost of a bailout hovers around a minimum figure of 60 billion euros. As for Italy, its technocrat government does not seem strong enough to implement structural reforms and austerity measures. Remember that the sovereign debt of Spain and Italy together is 10 times greater than Greece's. If nothing is done, Spain and Italy will soon be unable to roll on their debt in the financial market. In past months Southern Europe, plus France, has asked for the issuing of bonds backed by EU members, and for the direct injection of capital into banks from European funds. Last Thursday this concept had a new supporter in the person of Christine Lagarde, IMF director, who called for an urgent decision on both issues as time is running out. 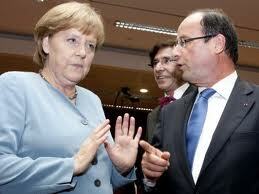 She also urged the ECB to adopt a more relaxed monetary policy. German Chancellor Angela Merkel does not want to hear anything about this “irresponsible thinking.” A meeting held last Friday in Rome between the leaders of Germany, France, Italy and Spain failed to produce any compromise on the debated issues. Merkel said the direct bailout of banks “violates treaties” and reiterated her opposition to Eurobonds, as well as to the purchase of bonds by the ECB. Germany is afraid of an uncontrolled drift that may result in a situation in which it is finally forced to endorse a big part of the southern debt. But on the other hand, it does not know the possible cost of a European meltdown for Germany. This uncertainty frightens it as well.